Last week I presented “How Change Gets Stuck” at a webinar hosted by the Association of Change Management Practitioners. I shared 10 ways change typically loses momentum during implementation. I was surprised at first that the #1 way change gets stuck was the change agent’s own Limited Personal Influence. I expected Lack of Leadership Support, the one I most often hear people complain about, to be at the top of the list. But when I think about it, Limited Influence subtly underscores the inability to control the rest of the items on the list. It’s knowing what needs to be done and not being able to do it. 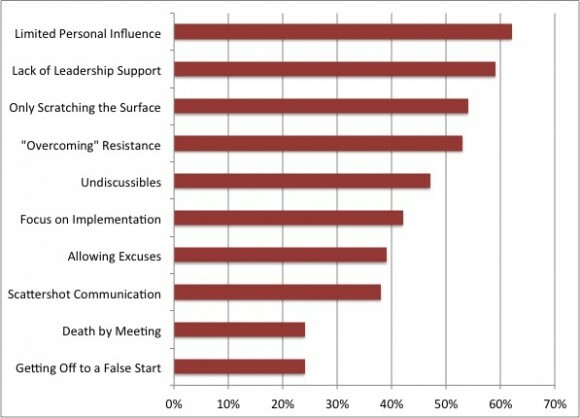 More than half of all change initiatives in the poll were also plagued by Only Scratching the Surface (the habit of not identifying the underlying behaviors, mindsets and culture that also need to change) or “Overcoming” Resistance (our tendency to address the things people do that signal resistance, instead of uncovering and addressing the source of the resistance). Notice also the items at the bottom: Death by Meeting and Getting Off to a False Start. Even though they are last on the list, almost 25% of attendees said these issues held their change initiatives back. Think about that. Almost 1 in 4 change initiatives were affected by the least pervasive problems. What do you think this data tells us? What would you expect, and what surprises you? Did you miss the webinar? If you are an ACMP member, you can watch the webinar here. If not, you can attend the same presentation at the August 19 ATD (formerly ASTD) webinar, registration open to all.